Why you should listen to me when it comes to connecting with kids. 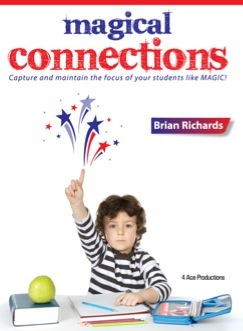 My name is Brian Richards and for the past 30 years I have had the wonderful opportuntiy of connecting with kids using my "educationally significant" programs in schools all over Minnesota, Wisconsin, Iowa, Montana and the Dakotas. During that time I consistently get asked the same question by teachers. “What’s your secret to connecting with kids and getting them so excited about learning?” Well, the answer is I have an UNFAIR advantage. The students see me as a fun alternative to learning in the classroom so the deck is stacked in my favor (pardon the pun). My brand new MAGICAL CONNECTIONS workshop can give you the same advantage. If nothing else it will get your class excited and anticipating the next days lesson. But here’s the good news...I can teach you some wonderful tools that make connecting with your students easier and more fun for YOU! Plus, I truly feel indebted to the schools and teachers I work with and as a result this project has become a way to say thanks to all the teachers, principals, aides, media specialists, counselors and PTA/PTO members who have invited me to their schools to make a difference in the lives of thousands of students. I dedicate this workshop to my two boys who are 12 & 15. They have had the great pleasure of being part of a wonderful school with very dedicated teachers who have made the process of learning FUN & EXCITING. I want current and future teachers to do the same, so this workshop is dedicated to teachers and priced to make it affordable to all!! Tremendous value that’s my goal for all teachers. I know how tight things are today. How many fundraisiers does your school have? How often do you have to beg parents to buy “extra things”? When in reality they are necessities for your class! This course is my gift back to the many educational systems that I have enjoyed working with for so long.